For the most part, emotions aren’t inherently good or bad — their effect ultimately depends on how you process them. Too much of a “good” emotion can be overwhelming, while traditionally negative emotions like fear, pain, sadness, and even guilt have their lessons to teach us. Growing up religious, I’ve seen guilt successfully steer people towards better choices (or away from poor ones), but I’ve also seen guilt consume people down to their very soul. In the wrong hands guilt can be a powerful and dangerous weapon, a tool to wield against others, to manipulate them and tear them down. Ananke, of course, has never met a weapon she hasn’t wanted to give a try, and in The Wicked + The Divine 1373AD guilt proves to be a potent addition to her arsenal. 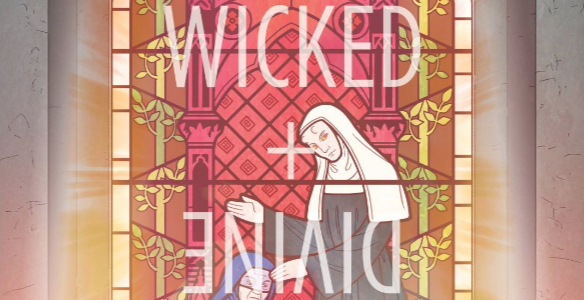 When Kieron Gillen and Ryan Kelly first introduce readers to the Lucifer of 1373, her guilt is obvious, but could be viewed as honorable, or even noble; she channels her piousness into serving others. Hell, when she confronts the Flagellants her guilt almost seems to give her supernatural endurance and insight. Gillen and Kelly turn these assumptions on their head rather quickly, though. Ultimately Lucifer’s guilt is corrosive, a quality that allows her to be easily controlled by Ananke. 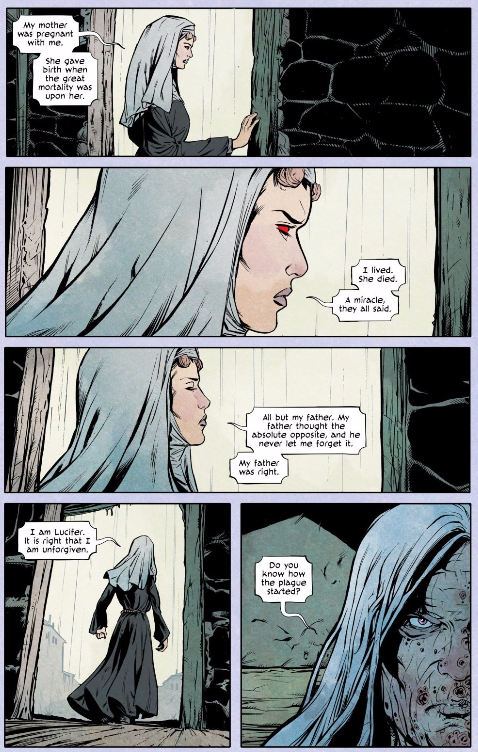 Ananke needs Lucifer to die; a sly manipulator in any era, she knows that Lucifer is just and righteous enough to murder Ananke if she confesses her sins, but also self-loathing enough to take herself out in the process as penance. Lucifer’s survival would have been a victory over Ananke, but survival was never an option to someone who considered herself damned, worthless, and evil. It made her an easy mark. Once we see the tragic source of Lucifer’s deeply ingrained self-hatred, it’s easy to understand why she is the way she is. Lucifer was told from birth she was evil, an abomination, so of course she internalized it — is it any wonder she believed that she was the devil long before she actually truly became the devil? This treatment of Lucifer is a mirror to the way families, organizations, and religions often use guilt to dehumanize, disempower, and control their members — just like Lucifer, people who are wracked with guilt are easy to manipulate. Lucifer’s story especially rings true to the LGBT community, who have been told that they’re evil, wrong, and inhuman pretty much since the beginning of time. That kind of guilt destroys lives. Lucifer isn’t the true monster in this story; Ananke is, and likewise, the true monsters in real life aren’t those made to believe that they’re worthless, but those who would dare to tell someone that in the first place.